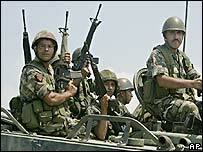 A number of countries meeting at the UN have offered troops for the expanded peace force for Lebanon. Bangladesh, Indonesia, Malaysia and Nepal have pledged troops, while Germany offered a maritime task force. The UN hopes to deploy an initial 3,500-strong force within two weeks. The UN deputy chief warned earlier that delay may threaten the ceasefire. France, which agreed to lead the force, says it will send only 200 extra troops immediately, far fewer than expected. The French government has expressed concern that the mission and mandate of the force are not yet sufficiently clear and has been seeking clarification. Under the terms of the UN ceasefire resolution which ended the month-long conflict between Israel and Hezbollah, the expanded UN force should work alongside the Lebanese army in the south to keep the peace. Each force should eventually number 15,000. Early on Thursday, the Lebanese troops began their deployment to the south, crossing the Litani river into areas previously controlled by Hezbollah. It was the army's first move back into some parts of the south since the 1960s. Israel says it has now withdrawn from two-thirds of its positions in southern Lebanon, including the port city of Tyre and villages of Qana, Hadatha and Beit Yahoun. Israeli Foreign Minister Tzipi Livni said the speed of its full military withdrawal was dependent on how quickly the international force arrived in the border region. The pledges came at talks in New York between UN deputy chief Mark Malloch Brown and representatives of some 49 countries, to discuss potential contributions. In addition to those offering troops, Britain and the US said they would provide logistical support and Italy and Belgium also indicated a willingness to contribute. "I would say the show is on the road," Mr Malloch Brown said after the talks. "We're in business, but [there is] a lot of work to be done in the coming days to meet the deadline." Mr Malloch Brown said earlier that the situation on the ground in Lebanon was tenuous and any delay in the deployment could lead to renewed fighting. He said he was disappointed at France's offer. "We had hoped - we make no secret of it - that there would be a stronger French contribution," he said. French President Jacques Chirac announced the 200 new troops, but in a conversation with UN Secretary General Kofi Annan, reportedly left open the possibility that 1,700 extra troops could also be sent later. Of particular concern is thought to be the issue of disarming Hezbollah. The UN resolution makes clear that no militants' weapons should remain south of the Litani, but the question of who will bring this about has not been resolved. Israel, Hezbollah and the Lebanese government have, however, all pledged to uphold the resolution. Meanwhile, a senior Lebanese reconstruction official has accused the government in Beirut of failing to take the initiative on rebuilding in the south. Al-Fadel Chalak, head of the Council on Development and Reconstruction, said there had not been enough decision-making and Hezbollah is filling the gap, with potential political repercussions. Lebanon's Public Works and Transport Minister Mohammed Safadi rejected the criticism, but acknowledged Hezbollah had taken an initiative and said the government itself was short of money.